Next time on Iothera: a page with an actual character on it! Anyway, welcome to Iothera! I’m really excited to be working on this comic, and hopefully you’ll be excited about reading it! The site’s still a bit rough around the edges, but hopefully that will all get squared away in the next few days. Yahoo! Nice to be in on this from the beginning. Does this share continuity with Heliothaumic? How about any characters (looking for an excuse to reread the HT archives)? My old hosting company vanished overnight with no warning— it was really annoying. :V Fortunately, this is more of a reboot/reimagining than a continuation, so you won’t need to bone up on old pages. Want to be excited by this, but can’t help remembering the several other comics that were great, and then never finished. Is Water Clock dead? 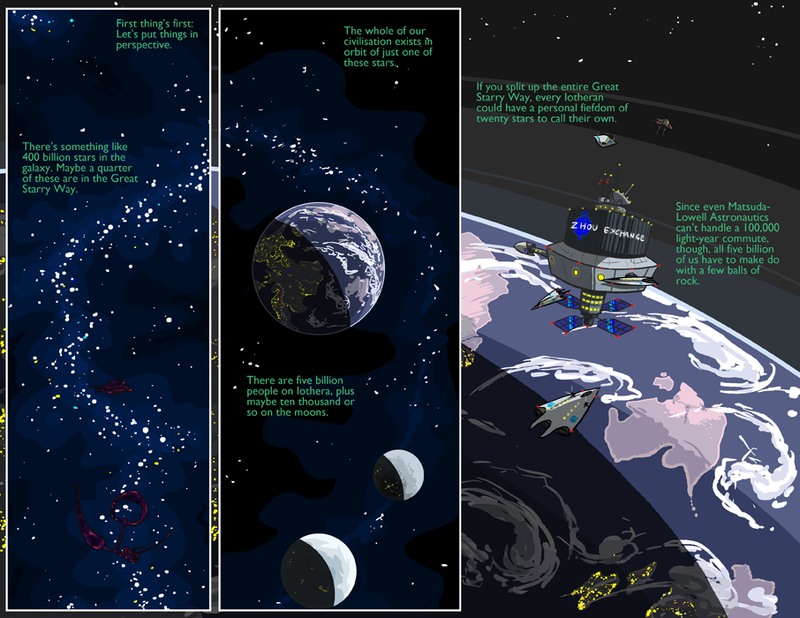 Haven’t seen updates to it in a long time, just pages from Iothera. Poor Water Clock was so short, I didn’t have time to get attached, unlike the much lamented Heliothaumic. Never read Midlands, now don’t plan to, since that will leave me hanging. If Water Clock is just going to be abandoned, I don’t have high hopes for Iothera. That’s fair enough— the main way I can prove that Iothera is here to stay is just by doing a whole bunch of Iotheras! The thing about The Water Clock, though, was that it was still sort of in soft-launch mode– I’d linked it from Heliothaumic and my tumblr, but I hadn’t started buying ads for it or anything yet, and I was still sort of seeing if it’d work. Very early on (the panel-by-panel updates meant that it had a whole bunch of “updates”, but really we were just like one scene in) I realized that I just wasn’t as interested in The Water Clock as I thought I’d be, so I decided it’d be better to just call it quits before anybody really got too attached to it and do something I felt more passionate about. Iothera, meanwhile, is something that’s been gnawing at my brain in various forms— such as the Midlands and Heliothaumic— for a very long time. Awesome! I’m glad you’re back to working on Midlands/Heliothaumic-related stuff. I second the request to repost the Heliothaumic archives. Can you at least upload a RAR, like you did for Midlands? So it took two tries to realize there were openeing pagesbefore this comic, with interesting stuff on them. This looks really exciting! I was post-midlands, but followed heliothaumic from the beginning. I was enjoying the waterclock too, but I understand your position on that. One question, though; are you still in grad school? That is, will there be regular-ish updates, or will life (as it should, this is a hobby) get in the way on an irregular basis (exams and the like)? The first few pages get me hopeful that this will capture some of the magic that The Midlands had and Heliothaumic never quite managed to find (for me). Also, please say you have a rough plot outline this time so you won’t want to scrap it a couple of years in again.